It's been an awesome year! We at My Saskatoon are looking forward to all that 2015 will bring, and we can't wait to ring in the New Year. There will be some big gatherings tomorrow night in Saskatoon, including events at The Heights, The Bassment, and Capitol Music Club that are sure to be a great time. Whether you're heading out on the town, planning a party, or having a quiet night in, it's nice to mark the coming of the New Year in some way. If you haven't made plans yet, here are a few ideas that will ensure a memorable NYE. If you're down for leaving the house tomorrow night but want to keep things low-key, plan a trip to the Cameco Meewasin Skating Rink in Kiwanis Memorial Park next to the Delta Bessborough. Admission is free and skates can be borrowed at no charge. The rink is open on New Year's Eve until 1am. The weather is supposed to warm up for tomorrow, so if you like the outdoor activity idea, why not ring in the new year with some tobogganing? Suit up in your winter duds, dig out your flying saucer or crazy carpet and welcome 2015 while sailing down the hill at Diefenbaker Park. Family traditions don't need to be elaborate in order to be memorable! Small children may need a break from the excitement of Christmas festivities and visitors. Make the evening low-key but special with a PJ party and hot cocoa. Camp out in the living room to enjoy a movie together or read stories by the fire. If you prefer to spend New Year's Eve reflecting on the past year and setting intentions for the new, here are a few questions to get the contemplative juices flowing. Another way to reflect is to simply consider the positive events of the past year. Write down your "Greatest Hits" of 2014- moments of happiness, success, and fun. The same can be done with kids! Have a few close friends over to cook together. There are a ton of different ways of doing this and you can get really creative. It might be fun to select the menu based around a theme, style of cuisine, or wine pairings. If you decide to head out on the town, there are a ton of local hotspots with great food and cocktails for your New Year's Eve enjoyment. Local bloggers Our Collective Muse recently posted an awesome NYE guide, including a big giveaway! Head over to Our Collective Muse to check out the hottest in New Year's Eve style, trending music, and local restaurant recommendations. No matter the NYE activity you choose, remember to plan a safe ride home. Saskatoon Transit and SGI have partnered to provide free bus service on New Year's Eve from 8pm to 2:45am. Customers will be able to flag down their bus from the curb at any point along the route- not just at specified stops. How great is that!? Whatever it is you end up doing tomorrow, have a fantastic last day of 2014! If your home is still in need of a little holiday pick-me-up and you're feeling a bit crafty, here are a few nice DIY decoration ideas we came across this week! We spent some time on My Saskatoon's Pinterest, and combined our favourites into this post. A few of these DIYs require some dexterity, while others are very easy to do and simply require a quick trip to the hardware store or market. Don't forget to shop local when you can this season- even small purchases make a difference :) And you might even avoid some crowds! We hope you enjoy this list of Christmas craft inspiration. It creates a nice opportunity to come together over some homemade goodies, nostalgic music, and great conversation. 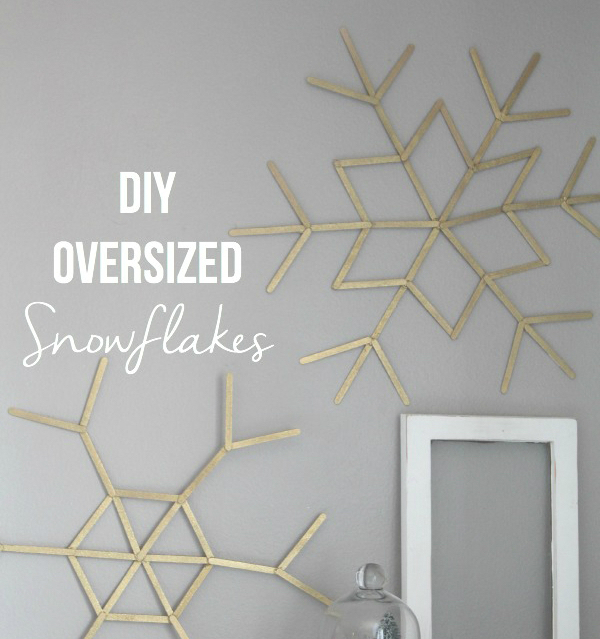 These giant snowflakes could be painted with metallics, whites, or brights to make a statement in any room. 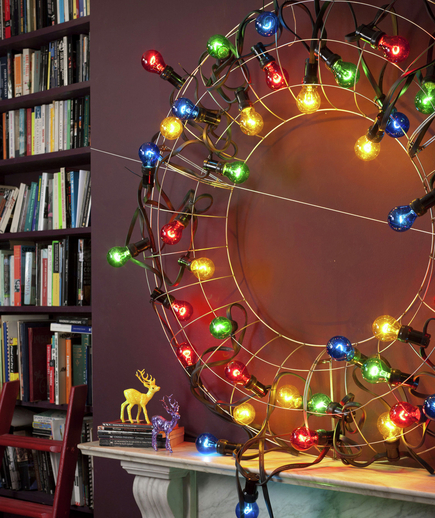 A wire wreath-making base and some bright bulbs make for a cool industrial look. Hosting a dinner party this Christmas? 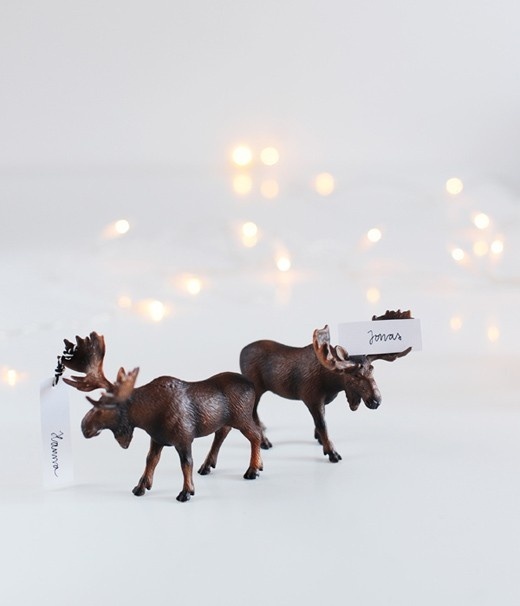 Moose place card holders will add a woodland touch to your table. 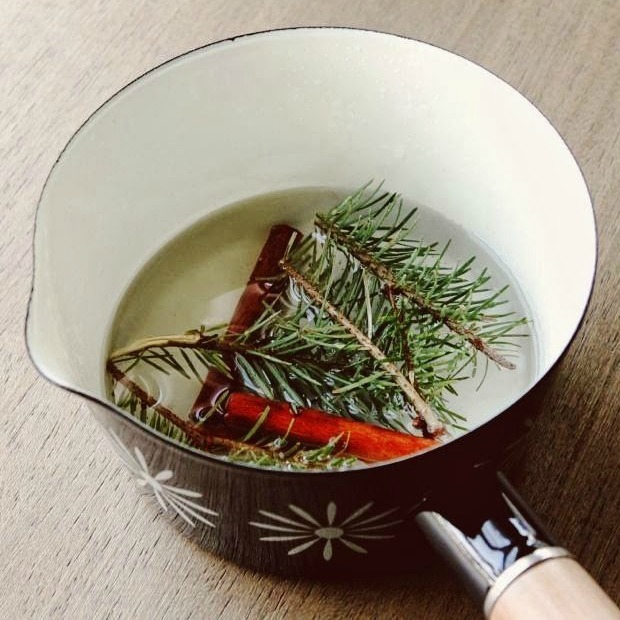 Scent can be a powerful memory trigger, so solidify those holiday memories with a delicious DIY stove-top potpourri. 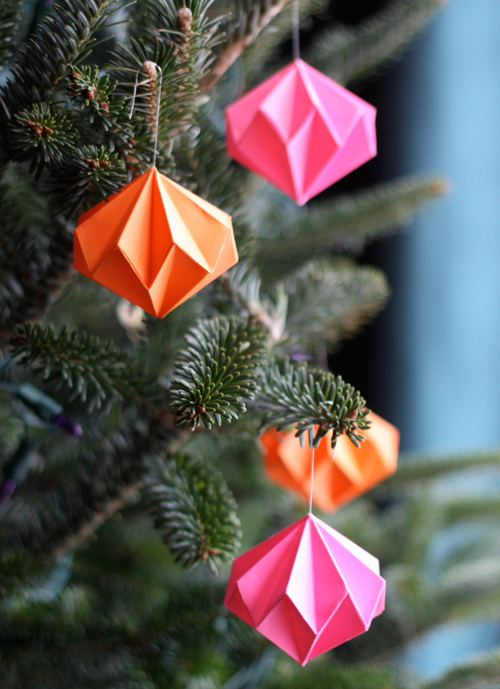 And here's a bunch of different easy DIY ornaments you can make out of paper to hang on your tree or in a window! We hope this list inspires you as it did us! Enjoy these last few days leading up to Christmas! 1. It's Moonlight Madness tonight at Lawson Heights Mall. This means that great locally owned shops like Believe Fit and Twisted Goods are open late until 11pm! 2. If you're a pet owner or you have pets visiting your home this Christmas, be sure to take a look at these pet safety tips for the holidays. Big thanks to the SPCA for sharing this. 3. Dec 21st is the last Farmers’ Market day until the New Year, so be sure to pick up your last minute local edibles and handmade gifts! 4. If you've been thinking about a flooring reno, don't miss out on the vinyl plank discount at Carpet Superstores. It ends in less than 2 weeks. 5. Sunday is Winter Solstice, meaning that you can expect an extra late sunrise. Sounds like the perfect opportunity to sleep in! 1. The Friendship Inn recently posted this video which provides a deeper look at the people who have been touched by the community at The Inn. The video is a great opportunity to see inside the doors of The Friendship Inn, and perhaps it will inspire you to get involved! 2. Big Brothers Big Sisters of Saskatoon has set a goal to fill 30 mentorship roles this month. Consider becoming a mentor and build a life-changing friendship with a child in need of mentorship. Connect with BBBS for more information. 3. Hands On Street Ministries has put forth a donation Wishlist. The folks at Hands On would be honoured to receive hot chocolate, children’s winter gloves, christmas oranges, and small gifts for children (among other things!). Take a look at the list and see if there is a wish you are able to fulfill for the kids at Hands On. 5. We want to hear from you! Which local non-profit or charity speaks to your heart? Tell us by connecting with Give Back Saskatoon on Facebook and Twitter! Paramount Day Spa celebrated its 65th birthday this month, and we at My Saskatoon are just in awe of the history behind this story. There are a ton of other locally owned and operated businesses in Saskatoon who have a rich history as well. Many local people, like Ellen at Paramount Day Spa, have been innovators in their industry here in Saskatoon, and a great number of businesses have been built up from scratch and passed on through generations. 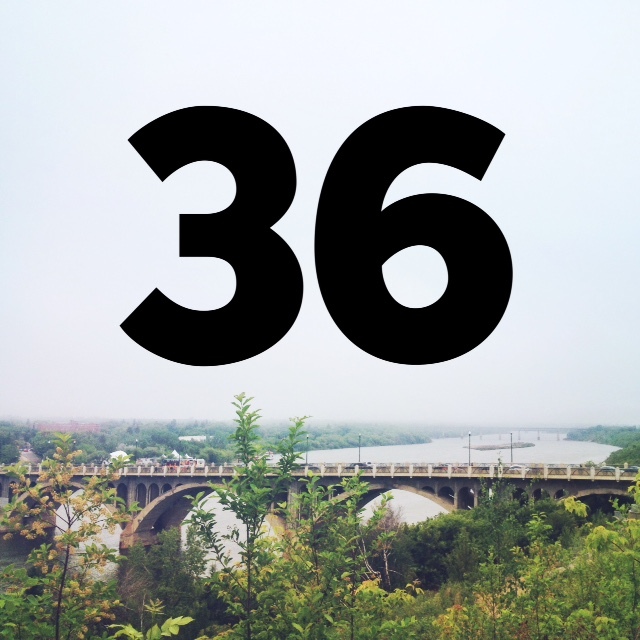 We browsed through our categories and put together a little list of some of the longest-running businesses featured on My Saskatoon. We are grateful to every entrepreneur in Saskatoon for taking the risk to bring amazing products and services to the people in our city, and today we'd like to give a shout out to these awesome local businesses! Fitness Solutions has been family owned and operated in Saskatoon for 23 years. The vision at Fitness Solutions is, and always has been, to provide Saskatonians with the tools to change their lives. Fitness Solutions carries a full range of cardio and strength equipment, yoga, CrossFit, and boxing gear, as well as a huge array of fitness and aerobic accessories. Top of the line stand up paddle boards, trampolines for both land and water, outdoor swings and water toys can also be found at Fitness Solutions. Whether you have a particular fitness goal in mind or are just looking for a new way to stay active and have fun, stop by Fitness Solutions on Circle Drive to chat with the experts. Incorporated in 1986, Braid Flooring & Window Fashions began its tradition of superior service, quality, and innovation. Braid has established a reputation for offering customers an amazing experience, from the initial consultation to the final installation. Over the past 28 years, Braid has grown to offer a wide selection of high end products beyond flooring, including Hunter Douglas window fashions and Farrow & Ball paint. If you're looking for a carpet that's great for pets, an eco-friendly flooring option, or the perfect paint colour for your room redesign, Braid's experienced design consultants can help you to choose from the diverse collection of modern, classic, and exotic products to match your home and lifestyle. Al and Lois Hattie started Al Hattie Insurance in 1982 with the basic principle of personalized, professional service for everyone. 32 years later, Al Hattie Insurance continues to be family owned and is operated by Al and Lois’ children and grandchildren. The staff at Al Hattie Insurance are dedicated to providing every customer with a friendly, pleasant atmosphere in which to do business. Al Hattie Insurance takes care of auto insurance, travel insurance, business insurance, and home insurance, to name a few. Al Hattie Insurance has recently added new convenient online options. Visit their website to renew your plates online! J&S Picture Frame Warehouse has been on the scene in Saskatoon since 1978, when owner Sherry Morris started her custom framing shop. 32 years later, in addition to custom framing, J&S also offers large and small format photo and artwork printing, scanning, and photo restoration. All work is completed with superb craftsmanship, expert advice, and friendly service. With expertise in framing artwork, photos, needlework, and all types of memorabilia, the expert framers at J&S Picture Frame Warehouse can help you to determine the best presentation and preservation for that special item. This month, Paramount Day Spa celebrated 65 years in business. A lot has changed over the years, including the location, the ownership, and the services offered by Paramount. A constant fixture at Paramount is Ellen Gaunt, who began working at Paramount over 60 years ago, went on to become its second owner, and maintains part time work as an esthetician at Paramount today. Paramount now offers an extensive menu of salon and spa services, European skin care, and professional hair products. Paramount also offers a selection of women's clothing, high quality giftware, jewelry and fashion accessories. Congratulations to all of these businesses for achieving such great success! What is Give Back Saskatoon all about? This month, My Saskatoon officially launched Give Back Saskatoon! Wondering what it's all about? Here is a little Q&A that might answer some of your questions! What is the difference between My Saskatoon and Give Back Saskatoon? The vision for Give Back Saskatoon and My Saskatoon came alive in tandem, with the overall goal of enhancing the way local businesses, organizations, and people connect and support one another both online and off. While My Saskatoon focuses on showcasing locally owned and operated businesses, Give Back Saskatoon serves as a connective hub for locally focused registered non-profits and charitable organizations who are working to improve the livelihood of our city. What exactly does Give Back do? Give Back Saskatoon is designed to increase the online visibility of local social profit organizations, and provides a platform on which they can convey who they are and what they do. Organizations will soon be able to communicate their material, financial, and volunteer needs on Give Back as well. Local businesses, families, and individuals who are interested in giving back to the community will be able to visit the site to find ways to contribute to local initiatives. All of the benefits of Give Back come at no cost to non-profit or charity organizations. So how is Give Back Saskatoon supported? Give Back is fully operated and backed by My Saskatoon, but the essence of the support for Give Back is ultimately our local Saskatoon business community. Every business with a profile on My Saskatoon, or who purchases advertising through our One-to-One campaign, enables local social profit organizations to be seen and heard online through Give Back Saskatoon. How can an organization get a profile on Give Back Saskatoon? Any business who is a part of our My Saskatoon community has the ability to choose a locally focused, registered non-profit or charity to receive a profile on the Give Back platform. Some of the local businesses on My Saskatoon haven't yet chosen a charity or non-profit, so we are open to requests from local organizations who would like a profile on Give Back Saskatoon. In addition, through our One-to-One advertising campaign, any advertising purchased by a local business is matched by My Saskatoon and offered to an organization on Give Back Saskatoon. If you are involved with a registered non-profit or charity who is dedicated to improving the livelihood of our city, and you are interested in being part of Give Back Saskatoon, feel free to contact us at info@mysaskatoon.com. Do you have any other questions for us? We’d love to hear from you in the comments, or drop us a line on Facebook and Twitter! Connect with Give Back Saskatoon on social media for our latest interviews with local non-profit and charity organizations, blog posts, and updates! Who is on Give Back Saskatoon? The people in our city are known for having big hearts and a willingness to give. At My Saskatoon, we believe that this is at the core of what makes our city so incredible, and we wanted to create a way to showcase the local organizations who are making a difference in Saskatoon. We recently officially launched Give Back Saskatoon, an online platform designed to increase the online visibility of local non-profits and charities at no cost to them. Give Back Saskatoon is fuelled by the local business community, and every local business on My Saskatoon will be hand picking a non-profit or charity organization to be featured on Give Back. Each week we will be adding more as new local businesses join our community. We thought we'd share with you the first few wonderful organizations on Give Back Saskatoon! Big Brothers Big Sisters of Saskatoon has set a goal to fill 30 mentorship roles by the end of December. If you’re interested in learning more about mentoring, contact BBBS today! Big Brothers Big Sisters is the chosen charity of Brothers in Grime. Day of Play is held annually in Saskatoon, as a way to bring families and children together for a day of fun in support of a great cause! Day of Play honors the memory of Rayna Korte, and all proceeds go to Saskatoon Crisis Nursery. Day of Play is the chosen charity of Maaco Saskatoon. Dedicated to enhancing the social, emotional, and physical wellbeing of children and youth, Growing Young Movers provides a new education model that ensures young people grow to be confident, physically and emotionally healthy members of our community. Growing Young Movers is the chosen charity of Granite Transformations Saskatoon. Habitat for Humanity helps low-income working families in Saskatoon achieve the dream of affordable home ownership. Habitat homes are built with 95% volunteer labour. What a great example of people coming together to accomplish something amazing in our city! Habitat for Humanity is the chosen charity of J&S Picture Frame Warehouse. Hands On is dedicated to serving Saskatoon's inner city children and youth by providing a safe environment, healthy meals, clothing, activities, and entertainment. The kids at hands on are loved, nurtured, and empowered to be all that they can be. Hands On Street Ministries is the chosen charity of Haven Builders. 1. Just in time for Christmas, Fitness Solutions is offering a free activity tracker valued at $119.95 with the purchase of cardio equipment. This is a great gift for anyone who wants to track their activity 24/7! 2. Today only, Believe Fit has Six Pack meal management bags marked at 25% off while supplies last. This is a perfect gift for the fitness fiend on your list. 3. Snap Fitness Saskatoon recently shared this post about 7 Things Healthy People Do Every Morning. 4. 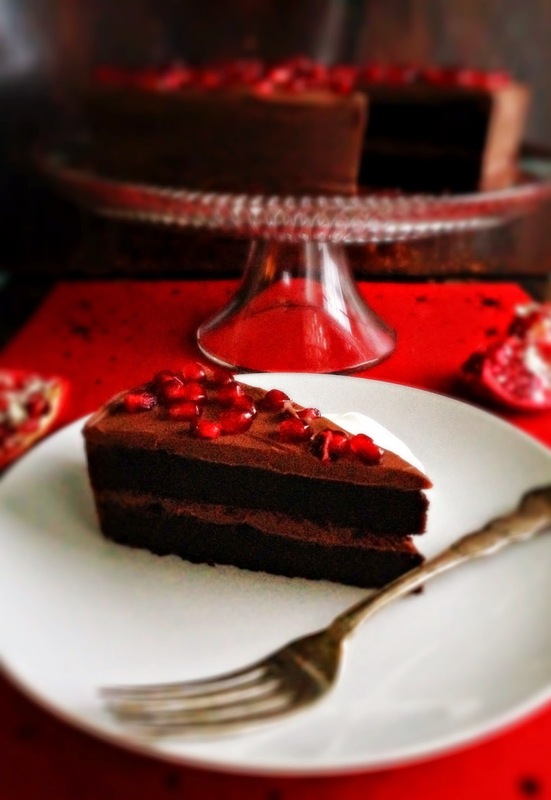 There's a free raw chocolate making class this weekend at the Farmers' Market! Space is limited, so sign up here. 5. 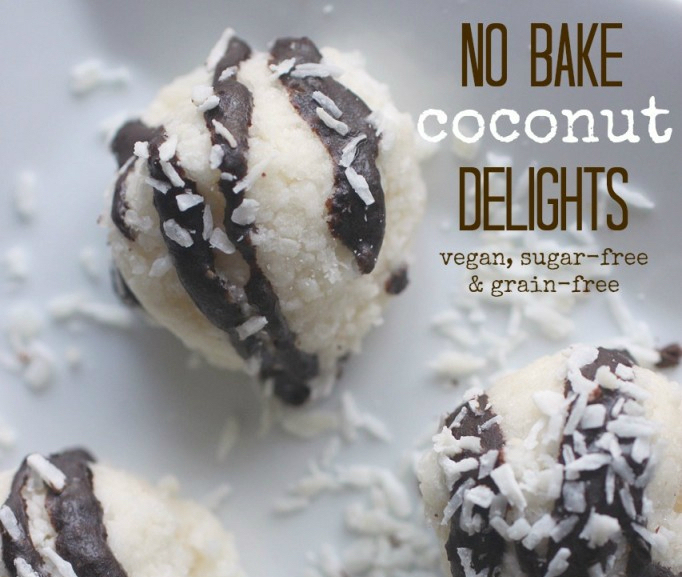 Add a healthy treat to your Christmas dessert repertoire with these delectable Coconut Delights. 1. Planning ahead for the weekend? Stop by the Saskatoon Food Bank PianoThon at The Bassment on Friday and enjoy great music while supporting the Food Bank with a non-perishable food item or a cash donation. 2. Paramount Day Spa is kicking off 12 Days of Christmas Sales with 30% off all socks today, plus 20% off clothing, jewelry, and accessories. 3. Big Brothers Big Sisters of Saskatoon has set a goal to fill 30 mentorship roles by the end of December. If you're interested in learning more about becoming a mentor, contact Big Brothers Big Sisters today. 4. Its Paddock Wood Brewing Co.'s 10th Anniversary this week! Growler bottles are 1/2 price, and there are additional daily deals today through Saturday. Connect with Paddock Wood for the details. 5. 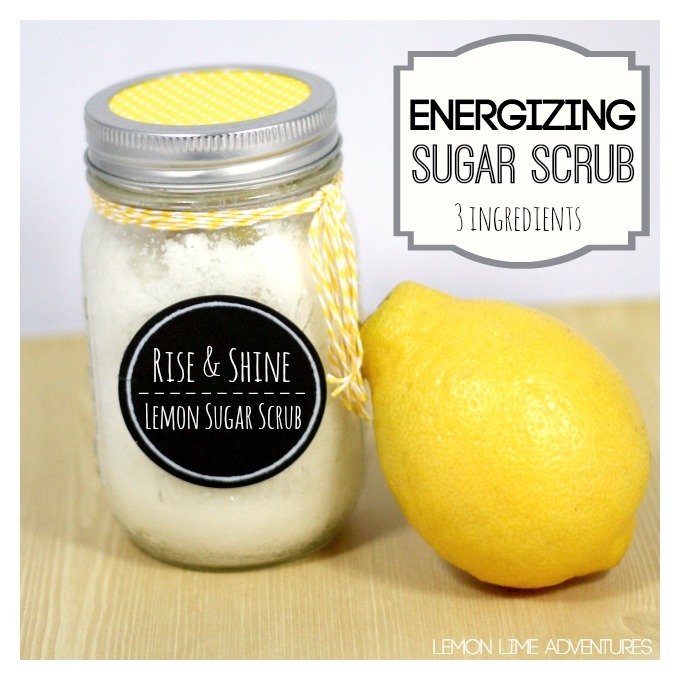 Here's a fun Christmas gift DIY that is easy for kids to help with or even tackle themselves.